Gaming keyboards: what's the deal with actuation distance? When you're not just playing for bragging rights, but for actual prize money and global recognition, you want gaming hardware that complements your skills and doesn't hamper your performance. As far as keyboards are concerned, they have to be durable, reliable, and most important of all, responsive. A key indicator of a keyboard's responsiveness is its actuation distance – the distance each key has to travel before it makes an electrical contact. Mechanical keyboards are the best for this, with actuation distances much shorter than standard keyboards, making them the go-to choice for pro gamers. There are actually three elements that you need to look at to get the full measure of a keyboard's responsiveness. As well as actuation distance, there's the USB polling rate – that is, the rate at which signals are sent to the PC – but there you'll find that most high-end gaming keyboards offer a polling rate of 1ms. Between actuation and polling, though, there's keystroke signal processing, or KSP, and it's this that can really make the difference between defeat and victory. KSP is the identification, encoding and processing of the electrical signal. It ensures that the intended input from the gamer is sent to the PC and it's this part of the three-stage process that can take up the largest chunk of time. Things like the quality of the keyboard's switches and the efficiency of its signal processing algorithms can affect how well the KSP system work and a poorly designed KSP system can result in multiple key presses being registered by the PC if not properly handled by the keyboard's internal logic. In short, a bad KSP system won't just slow you down, it can send out the wrong signals and completely ruin your game. That's why, if you demand professional-level performance, you need the new Logitech G Pro Gaming Keyboard. Designed and built to the exacting specifications of the world’s top eSports athletes, it's made with one simple purpose: to provide you with everything it takes to win. 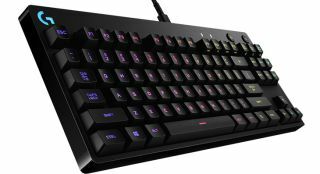 It's a mechanical keyboard with an actuation distance of just 1.5mm – 25 percent faster than the standard mechanical switch – thanks to Logitech's own Romer-G switches, and it's also packed with technology that makes its KSP faster than the competition. Its Romer-G switches feature dual actuation points, allowing for improved KSP due to reducing key chatter and electrical noise, and the G Pro also boasts a highly optimized micro control unit and signal processing algorithm. What this all adds up to is a KSP time around 10ms faster than the G Pro's nearest competitor; and if you're a player of lightning-paced MOBAs then you'll realize that a lot can hinge on that sort of advantage. There's more to the G Pro than raw responsiveness, though. Its compact Tenkeyless design dispenses with the numeric keyboard altogether, gaining you desk space for mouse maneuvers. This is especially useful if you're a low-DPI player, allowing you to have your hands in a more natural position. It's built for comfort with a three-step angle adjustment, and its steel backplate means extra durability and stability, so it won't slide around when things get hectic. Anyone who spends a lot of time travelling to gaming competitions will appreciate its detachable six-foot braided cable that you can remove and store separately when you're in transit. You’ll be safe in the knowledge that it won't get damaged or horribly tangled en route, and that when you arrive you'll have length to spare when you're plugging everything back together. G Pro's per-key RGB lighting features surface mounted LEDs that improve connection strength and reliability over standard keyswitch-mounted mechanical keyboard backlighting. It offers fully customizable lighting options using Logitech Gaming Software, with ready-made profiles for over 300 games. You can even save a lighting pattern to the G Pro's board memory so it’s available for use in competitions that don't allow custom software. What will really matter to all serious gamers, though, is the G Pro's durability and reliability. Its Romer-G switches are tested for 70 million keystrokes, making it up to 40 percent more durable than the standard mechanical switch, and every single component, from the steel backplate upwards, is built to last. When the stakes are high, you can be sure that it won't let you down. Designed to exacting specifications for pro gamers to ensure that they can play to win, the Logitech G Pro Gaming Keyboard is available now. Order today to get an instant advantage. Learn more about the Logitech G Pro Gaming Keyboard.